In this instalment of Picture in Time we are back in Blackpool as we take a look at the highest numbered of the iconic Balloon Cars to be built, now numbered 726. Entering service in 1935 – and originally numbered 263 – the tram was the not the last Balloon to arrive in Blackpool with a further two delivered after 263. It received single indicators in 1974 and then lost its trolley in favour of pantograph operation in 1991. By the time this photograph was taken – on 23rd September 2009 – it had received a pleasing and simple all over advert for HM Coastguard, a livery it retains today in preservation. It is currently in private ownership and is stored at Rigby Road Depot. 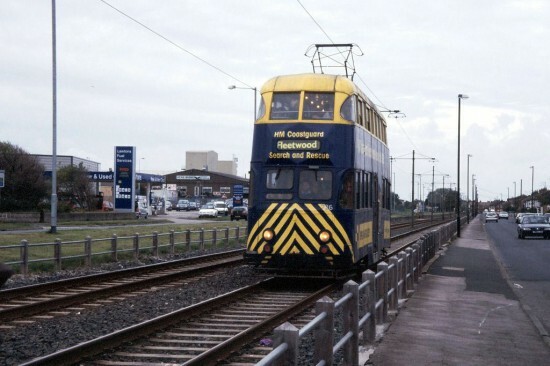 The tram is seen running between Lindel Road and Stanley Road stops as it comes towards the end of its journey to Fleetwood.